Posted by Jace Stolfo on Friday, February 18th, 2011 at 1:29pm. The Boise Idaho real estate market was up again in January over the previous year by 28%. There were 193 home sales compared to 138 the same time last year. Because real estate activity is cyclical, it’s helpful to compare to sales of similar months to previous years. 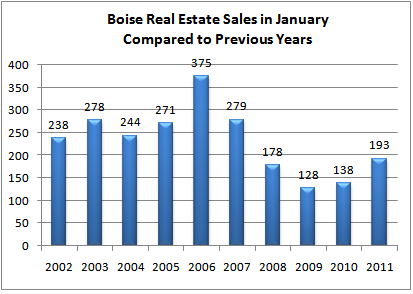 The graph below shows the January home sales in Boise since ’02. Fifty-two percent of the home sales were foreclosure properties. This is up 3% from a year ago. The majority of the Boise Idaho foreclosures selling are located on the Boise Bench (15%+/-), SW Boise (22%+/-), and far West Boise (21%+/-). Since about September, there have been a larger number of lower price range foreclosures in the Boise Idaho real estate market. Many of these properties have been quickly scooped up by investors and has helped push the median home price down to $130,000 for the last three months. The median home price can be an indicator of the pressure on real estate values. As you can see above, things had been relatively stable but in recent months with an up-tick of cheap foreclosure properties on the market the median price shifted lower. In January ‘11, there were 23 sales under $75,000. Two were short sales, three non-foreclosures, and 18 were bank-owned. Forty-eight percent of these purchases were cash transactions compared to just 16% for homes over $75,000. The majority of the Boise Idaho real estate activity is in existing homes. New homes accounted for just 24 sales in January while existing homes produced 169 sales. The neighborhood with the most new home sales was Harris Ranch in NE Boise. For Ada County as a whole, there were 47 new home sales. Up from just 32 the same time last year.